Groningen, the Netherlands – May 17, 2013. 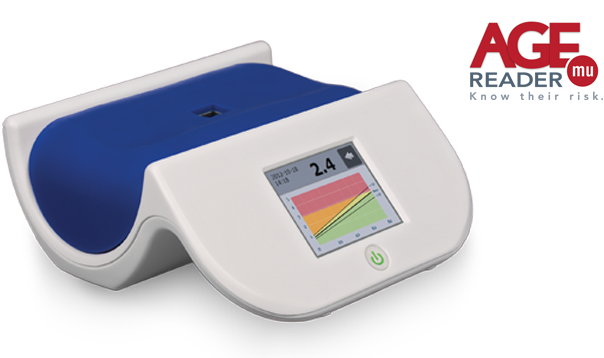 DiagnOptics receives CE mark approval for their latest product, the AGE Reader mu. The AGE Reader mu enables a doctor to non-invasively assess the cardiovascular risk of their (diabetes) patients within 15 seconds. The CE mark allows DiagnOptics to market the AGE Reader mu in the European Union. The AGE Reader provides an immediate prediction for the cardiovascular risk of patients. The measurement is reliable, real time and non-invasive. The now introduced new generation AGE Reader mu combines improved performance with a great design. The measurement time has been shortened, the battery allows ‘wireless’ use for an entire day and the accuracy of the measurement has been further improved. Last but not least, DiagnOptics has been able to reduce the cost of the AGE Reader to level that is not matched by any other manufacturer. DiagnOptics was the first company worldwide to introduce a technology to non-invasively measure the tissue accumulation of AGEs by means of fluorescence techniques (AGE Reader). The AGE Reader has been used in clinical practice and research since 2006. Since the introduction of the AGE Reader around 100 peer reviewed scientific papers have been published.